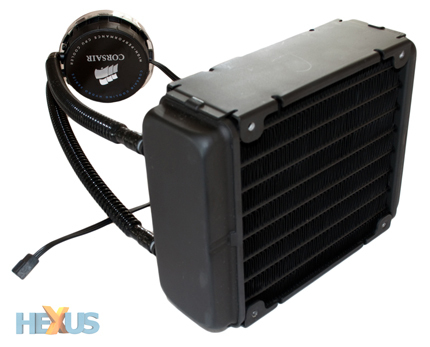 There was a time when choosing a CPU cooler was for the most part simple and straight forward. For the majority of users, the manufacturer-bundled cooler was sufficient, and for those wanting to lower temperatures there was always a cooler that measured twice the size and weighed twice as much. And, of course, those with adequate home insurance could also dabble with elaborate water-cooling kits. That was the general idea, but then Corsair came along with the Asetek-powered Hydro Series H50; a plug-and-play unit that proved liquid cooling can offer class-leading performance without breaking the bank. However, whilst last year's H50 is undoubtedly good, Corsair's now hoping to go one better with a follow-up model that promises to be bigger and better in every sense. Dubbed the Hydro Series H70, this new-and-improved implementation of a tried-and-trusted formula promises to be "the best high performance CPU cooler on the market, bar none". So what's changed? Well, for starters, the price has gone up. Whilst the H50 currently fetches close to £57 (roughly equivalent to a high-end air cooler) the new H70 will set you back around £77. That's a hefty £20 more than the original, and bordering on "is any cooler worth that amount?" territory. But don't turn a blind eye just yet. Corsair reckons end users will be able to stomach the additional expense in exchange for "several significant upgrades". For starters, you get a thicker-than-ever radiator. Keeping to chassis-friendly dimensions, the radiator remains 120mm in length but now measures 50mm thick - making it twice as chunky as the radiator bundled with the H50. 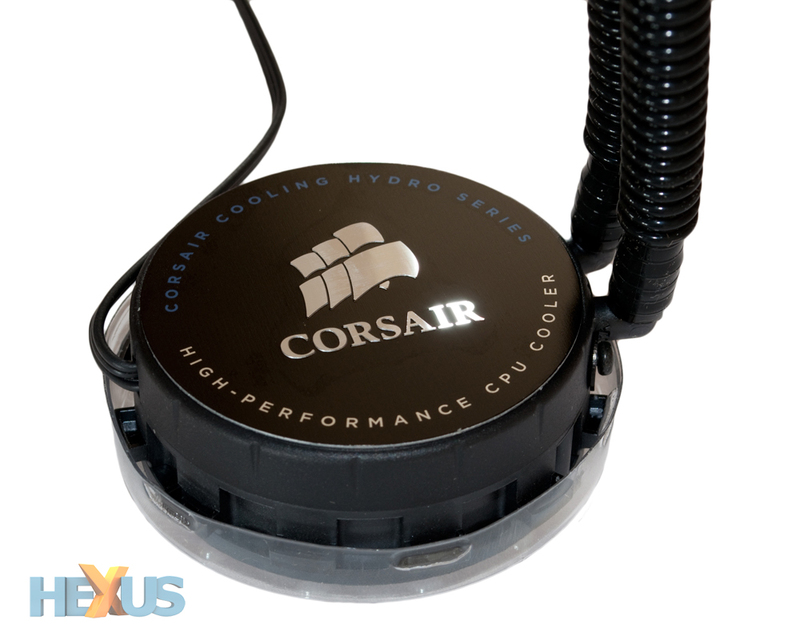 It's interesting to note that Corsair doesn't yet offer a 240mm radiator - saving that for the Hydro H90, perhaps? - but the wider H70 radiator introduces a higher coolant capacity and a much larger surface area that should provide improved heat dissipation. 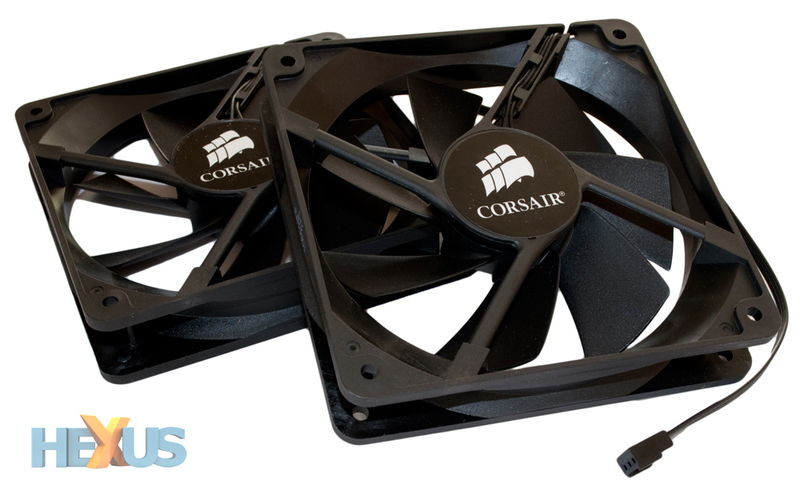 And, on top of that, Corsair throws in a better airflow solution, too. Continuing in the doubling-up approach, the H70 ships with two 120mm fans as standard. 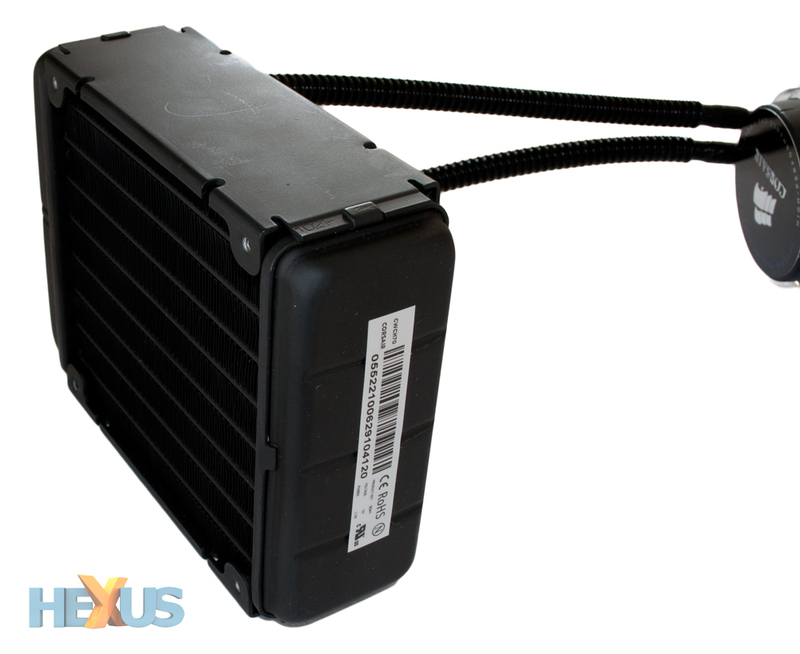 Installed in a push-pull configuration, a single fan attaches to both sides of the radiator; one pulls cool air in from outside of the chassis, and the second continues to pull that air through the radiator and into your enclosure. The duo will together provide more airflow when compared to the H50's single fan - but it's worth noting that last year's cooler can also be configured in a push-pull arrangement if you're willing to pick up an optional second fan. We were, so we'll provide benchmarks in both configurations a little later in the review. Taking a closer look at fan specifics, Corsair's new duo are themselves upgraded to operate at a maximum speed of 2,000rpm (that's 300rpm quicker than the default H50 fan). At top speed you'll achieve an air flow of 61.2cfm, whilst noise levels will hit 31.5 dBA. If the acoustics aren't to your liking, Corsair bundles two step-down adapters in the box; they enable you to lower the fan speeds from 2,000 to 1,600rpm, dropping noise level down to 26 dBA in the process. Rounding off the upgrades, Corsair's pump has been given a low-profile makeover, too. Yet, despite now measuring just 30mm tall, it features an improved copper cold plate that's directly integrated into the pump coolant via copper micro channels. What we really like is that the attached pipes are now rotatable, making installation that little bit easier. The size of the pump allows for use in tighter spaces, and it's notably light when compared to most air coolers, so you needn't worry about placing unwanted stress on your mainboard. Sounds like a useful step in the right direction on all fronts, and Corsair's internal benchmarks claim that the H70 will offer 15 per cent better performance compared to last year's H50. But is it worth the 35 per cent hike in price? Read on to find out.